The weather is hot for cycling in summer - but the cyclist gets more breeze than the pedestrian. In winter, the weather is perfect for cycling (20C, 70F). In Luxor the conditions for cycling are excellent. The distances are not great; there are many places to hire bicycles and the streets are not heavily trafficed. Luxor also has many places which hire bicycles by the day (or by the week). You will need to leave some form of ID at the shop (eg a driving license or perhaps a $100 bill) and if you want a padlock you should take one with you. Tourists mostly leave their bikes (unlocked) beside the tourist police kiosks a the entrances to archaeological sites. A small tip will be appreciated. There is a regular ferry service across the Nile (near the Luxor Temple) for a very low (and state-regulated) fare. Alternatively, if you have the energy, you can cycle upstream to the Nile Bridge. It is a great opportunity to view the almost-Biblical agricultural land. If you decide not to cycle, the best alternative is a taxi. Coach tours are dreadful: they give you a short time on the site and more than enough time at the coach driver's favourite tourist shops. 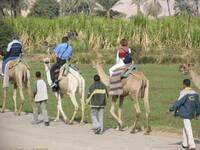 Camel rides and donkey rides are OK but you do not get enough time to absorb the sites. Almost everyone seems to speak English, down to the poorest beggar-children. You must expect to hassled for baksheesh (money) at every turn but no one will be unpleasant if you decline in a friendly voice and say what a wonderful country Egypt is. If you get cross they might get cross - but the Egyptians have a well-deserved reputation for friendliness and honesty. At night, it is much safer to walk through Cairo than through London..
Notes on sites to visit in Egypt and on tours in Egypt.